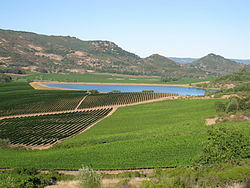 The Atlas Peak AVA is an American Viticultural Area located within Napa Valley AVA just northeast of the city of Napa. The appellation sits on a higher elevation than most of Napa's wine region which limits the effects of the cool fog coming in from Pacific Ocean. The westward orientation of most vineyards on the Vaca Mountains also extends the amount of direct sunlight on the grapes. The soil of this AVA is volcanic and very porous which allows it to cool down quickly despite the increased sunlight. The area has a fairly significant diurnal temperature variation upwards of 30 °F (17 °C) between daytime and night. This contributes to the balance of acidity that grapes from Atlas Peak vineyards are known to have. ^ Code of Federal Regulations. "§ 9.140 Atlas Peak." Archived July 10, 2008, at the Wayback Machine Title 27: Alcohol, Tobacco and Firearms; Part 9 — American Viticultural Areas; Subpart C — Approved American Viticultural Areas. Retrieved Oct. 30, 2007. ^ a b c Appellation America (2007). "Atlas Peak (AVA): Appellation Description" Archived October 7, 2007, at the Wayback Machine. Retrieved Oct. 30, 2007.